We all have those pervasive, often toxic species of ‘weeds’ that take over our horse pastures until there’s barely any grass or edible forage left. One solution is to dump a layer of chicken manure over your pasture and just put up with the smell for a couple of weeks – and that will knock out a bunch of pervasive plants like buttercup. I know other people who hand-pull plants by the roots. One rancher I talked to recently spent 12 years pulling clumps of ragwort out by the roots to finally eradicate it from his land. So when I watched this video and learned of Will Harris‘ method for weakening these fast-growing annuals, whilst strengthening the slow-growing perennial grasses, I was intrigued. 2. As soon as the perennial grasses have a decent foothold, bring in cows, sheep or goats for only an hour or two to lop off the annuals – which they’ll eat first because they’re large and succulent compared to the sprinkling of grasses. 3. Take the cows/sheep/goats off and allow the grasses to keep growing. Of course the fast-growing annuals will also be growing, so you need to keep bringing the cows/sheep/goats in for brief grazings for up to 2 years to keep lopping off the tops of the annuals. 4. By that time, the desirable grasses will have established their 6 – 8 foot long roots and will be able to hold your pasture in grasses; without being crowded out or taken over by the annual weeds. However, Will still practices rotational grazing; alternating herds of cows, sheep and goats on an ongoing basis as he says it is the best system for maintaining the health of the pasture. He is considering experimenting with mixed-herd grazing at some point. Now, as you can see, Will is starting out with stripped, barren soil. So I don’t know how well this method would work in a normal field that has simply been plowed – but it would sure be interesting to test it! And man, you would get an amazing pasture that would sustain your horses for the next 100 years from only 2 years of management and reseeding. Pretty good payoff for the investment I’d say! 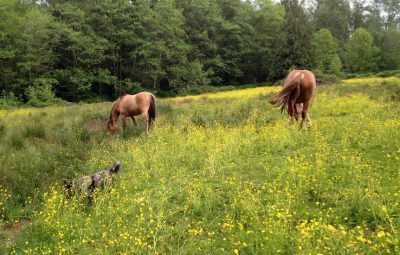 I have 4 horses (and a foal) currently boarded on 6 acres of about 70% noxious or undesirable plants, and 30% grass and edible forage, and 4 acres of forest, but no cross-fencing. So this spring I purchased a 60 lb bag of horse pasture forage blend seeds and hand-spread them over parts of the pasture. I wanted to see if the seeds could do anything to improve the pasture vegetation even though I could not take my horses off the field at all. Well… nope. I don’t believe it had any effect at all. I think as soon as anything edible began to sprout, my horses mowed it down and the inedible/toxic plants flourished undisturbed as usual. I know some people have had success putting some sheep or goats in with their horses – which also has benefits for worm control, but you’d need a good Livestock Guardian Dog or two to carry that off. 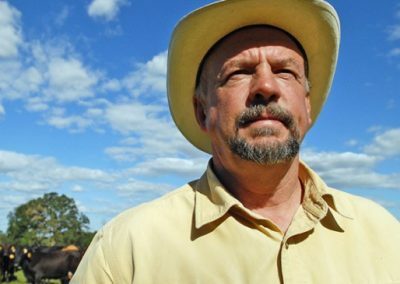 Will Harris (video above) uses sheep, goats and cows in rotation and he says between the three there is only 1 weed that is left uneaten/controlled – thereby completely avoiding pesticides or herbicides. Next, I talked with a local farmer who grows low-sugar hay for horses. But before that, he was a dairy farmer. He told me that he had a 6 acre field that was the turn-out area for 150 cows; who were on that pasture for 12 hours/day. Twenty-one years later, that field is still his top hay producing field! He said that cow manure is the equivalent of a Triple 18+ fertilizer. He also advised me to just borrow some goats for my pasture – that the goats will come in and just clear all the weeds in month or so. I’m not sure how my horses would feel about a bunch of goats running around – probably they’d be fine or even enjoy them! Unfortunately, my fencing is not good enough to contain goats, but it’s a nice idea to tuck in my file for future reference. And I wonder if sheep are easier to contain than goats… I must admit, if I had to choose, I would go with sheep because they are also a natural equine worm control agent! Hey, I wonder if there’s a business idea here for someone who has sheep and goats they could rent out to horse owners on a rotational basis. Especially if you trained them to stay inside normal horse fences (if that’s even possible?). All it would take is a good website with videos to educate horse owners and advertising the service everywhere horse owners shop, hang out, equine associations, newsletters, etc. Personally, I would pay for this in a heartbeat! I would love to hear from anyone who’s been able to test different methods and/or come up with some successful methods – just leave your comment below! So interesting: this valley has a terrible amount of hawkweed, which has a rosette that plasters down on the ground, and even mowing the flowers down causes the plant to react by sending out runners: so many methods of regenerating. We have heard that large amounts of nitrogen will kill it and one local farmer said he tried that and just grew more hawkweed, but I suspect he used inorganic fertilizer. Nobody eats hawkweed, except this year I saw the baby goats eating the flowers. The thing with goats is that they like a varied diet so they don’t stick to one thing, and might avoid it entirely after gorging on it once or twice. Will is still absolutely right, the different species eat different things down to different levels so the rotation is key. We just spent a whack of money on fencing but didn’t do a lot of cross fencing: HOWEVER, the fencers made quite a mess along the fenceline and suggested planting Orchard Grass for remediation. We thought about it and realized we didn’t want to encourage the cows right up to the fences with lush grass, so instead we used it on the areas the cat tracks had dug up and the places where the pigs had been rooting: as it happens, the pigs like the damp areas that are quite acidic and are being colonized by buttercup and orchard grass likes it kind of acidic, so…we’ll see. The experiment continues: we do have a separate 2 acre field where we can put any species for a few days at a time, and we can also cordon off the new plantings with electric, so almost as good as cross fencing and rotating: the thing with rotating, if the paddocks aren’t huge, the animals can’t roam and run like we want them to. BUT! horses will tolerate goats after they figure out what they are, you just have to be careful at first. I don’t know sheep, but I’ve heard they nibble the grass right down to a nubbin and aren’t as fond of weeds as goats are. 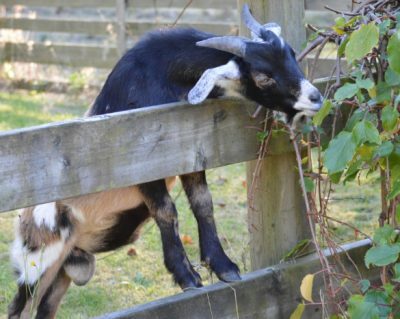 Actually goats prefer browse, which is the tougher shrubs and deciduous leaves are a real treat. Here’s what I think is the important part: like you, we hand seeded the grass and then a few days later, after some rain, we hand seeded a forage mix: I got oats, peas and barley from the local grain farmer, mixed them together with oats at 50% (you can go higher). My niece who has farmed her whole life and trained in natural resource management told me that the annuals will protect the grass as it’s getting started. This grass will take 18 months to get established. So at first, before the various plants are up, it’s fine to let the horses range over the newly planted area, to stomp in the seeds and drop manure, but after a bit you want to get them off there and let the annuals come up. And yes, goats or non-rooting pigs (ha!) or maybe cows will lop off the annuals and also add poo, and I can see how you can rotate in the species even if you aren’t cross-fenced. But then we have to keep an eye out so we know when to run the electric around the couple acres of planted area, to let the annuals grow up again and meanwhile hopefully that grass is getting started. The grass shouldn’t be grazed til it’s about 6 inches high, and then only down to 2″ so managing that will be interesting. Another cool thing is that legumes are nitrogen-fixing so we’ll see how that affects the hawk weed. We’re experimenting with the areas ploughed up (by the pigs) and the areas scraped by the cat, and also areas that are worn out because the soil is poor and dry. We’re thinking about having the field dragged in the fall to spread all that horse (and soon cow) manure out. We can take the PH of various areas and add agriculture lime here and there as needed. I’m sure we could also take a wheelbarrow and feed really sparse areas with composted manure. As you can see, we don’t know anything yet, it’s all trial and error. I realized later that we had RIDICULOUSLY over-seeded with the (very expensive) orchard grass, which comes up in bunches, so we’ll have to see what the consequences of that are: whether we’re just ensuring survival of some of it or whether it crowds itself out. We do research everything but sometimes we get so busy we just have at ‘er and then realize later hmmm…we could have done that differently…and then again, since life is half planning and half magic, sometimes our timing is deliciously perfect, like when I get really urgent about planting the legumes and it rains hard for the next few days. To be continued, right? Pasture is the basis of everything. SO so interesting Sharon!! It would be very cool to check in with you again in 3-5 years and get a run-down on what worked, and what didn’t. I think the shortest answer/route is simply to have enough land for pasture rotation to happen naturally… which of course would vary depending on the land/terrain/climate. Lucy Rees, who’s been studying a wild herd in Spain (mountainous region, quite dry/desert in areas, other areas meadow) for a decade or so, says they need 100 acres per horse to be completely self-sustaining. I wonder how much you’d need in your area (not including the winter months) to not have to rotate the pastures… But of course, then you have to be able to perimeter fence your property! AND we’re back to just doing what you can, researching, planning and then also just trying stuff out. Speaking of which, I had to buy a bag of whole oats for the wildies (the rescue had been feeding them that) but I’d rather plant it then feed it. Can I just sprinkle it around or do I need to soak them first? Or are they actually not seeds? seeds! Those are whole oats. If you want to test the germination rate first, you can plant a few cups of dirt with one in each cup…or just go ahead and broadcast it out there. The thing about soaking it first is that it can speed up germination (which might be good if you’re doing a trial) but if it doesn’t rain right after planting soaked seeds you might strand them so better to just throw them on out there. 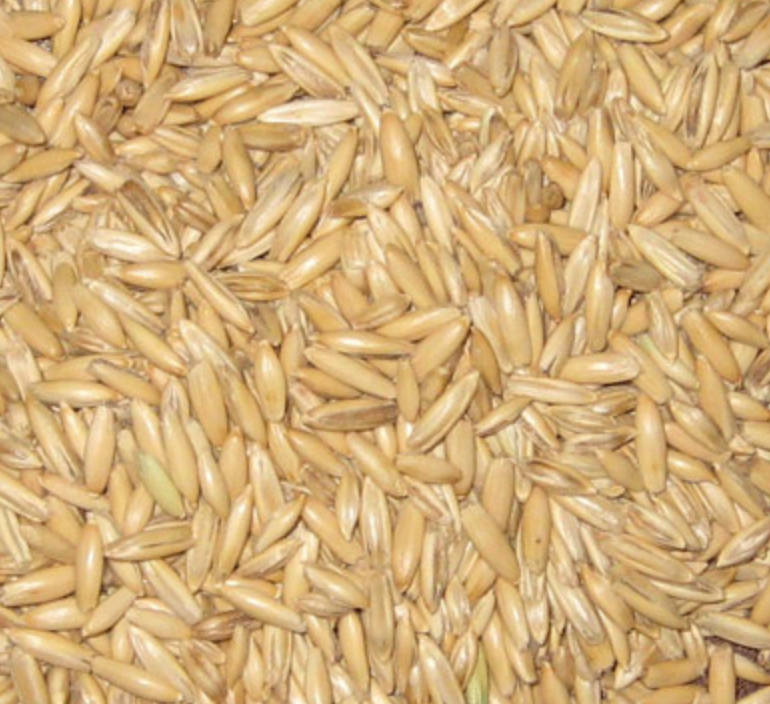 I paid $11 per 60 pound bag for the oats, whereas the Orchard grass was $5.00 (gulp) per pound and we threw 100 pounds around like it was water. Ok perfect. Yes, I’ll just chuck them about once I fence off an area and then see what happens. And I can’t believe the price difference between oats and grass!! That makes no sense – except that I guess there’s a whole lot more farmers growing oats so basic supply in the marketplace I guess.